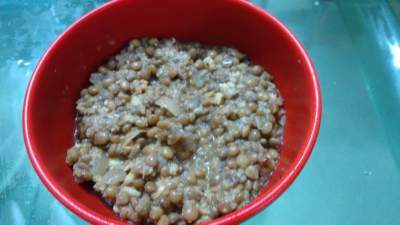 Wash and soak the lentil in water for 2-3 hours. Roast the spices and coconut lightly. Allow it to cool, then grind it a paste with some tamarind pulp. In the same pan fry the chopped onions. Add the lentil and water so that it boils. Red lentil becomes soft after soaking in water for 2-3 hours, so you do not need to pressure cook it. When the masur is cooked, add the ground paste. Add salt as per taste and let it cook for another 2-3 min.